No, you can’t use food stamps to buy pot in Colorado. Here’s the deal. A site called The National Report wrote this thing about people using their EBT to buy pot in Colorado and they interviewed a pot store owner who was accepting SNAP to pay for pot edibles. It got even more confusing when I started reading reports that the pot shop was raided by Feds and were no longer allowed to accept SNAP. There was a link to the pot shop’s website in the article that actual went to what looked like a pot shop’s website. There was talk about Colorado trying to fix this snafu so people couldn’t but pot brownies anymore with SNAP (even though they weren’t allowed to in the first place). The slight kernel of truth here is that yes, someone who gets TANF (cash assistance) could hypothetically use their EBT card to get cash from an ATM and then take that cash to buy pot. Maybe I need to back-up here and explain how EBT cards work? An EBT card is given to both SNAP and TANF recipients. It’s actually hard to be approved pretty much everywhere for TANF and the amount you get isn’t very much. Some stores will not allow TANF to be used at the register. Recipients have to go to an ATM and use their card there to withdraw their cash allowance. Yep, they can take that cash and use it anywhere they want. No, I don’t care what they spend it on. Hey, pot is legal in Colorado, so there’s that. I guess I look at it this way…members of Congress do drugs and take a lot more of taxpayer’s money and they don’t exactly work for it (let’s stop pretending most of them do). And come on, Nancy Graces of the World…. it’s pot . I don’t even smoke it and I can’t hate on it. I’ve seen what alcohol & other drugs do to a person’s life. It’s not usually the case with pot. But this isn’t meant to be a drug debate post. 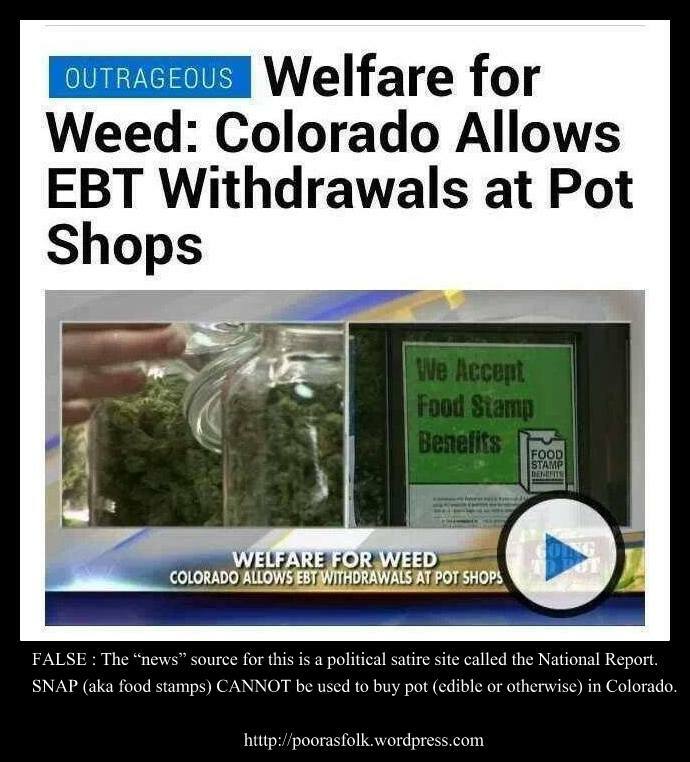 I just wanted to debunkify the mass circulated “news” article that let everyone belive you could buy pot with food stamps in Colorado. You can’t . The End. Next Next post: What to do with life and it’s lemon handing.